At first, Andrew Cree II had to respect Bryan Long Jr.’s “Madden” skills. Cree, a linebacker at Ohio, said he’s one of the top five “Madden” players on the team. And in saying that, he also named some other good players. Long was a part of that group, along with Michael Ballentine and Jaylen Morgan. Those were the top three Cree knew. Long, a wide receiver, couldn’t acknowledge Cree’s “Madden” skills, though. While the Bobcats play real football, they like to indulge in “Madden” and other video games when they have free time. Playing video games is an off-field activity, but it still allows the Bobcats to build chemistry and friendship. Cree, Long and others don’t hesitate to talk trash to each other when they’re on the sticks, though. When Cree heard what Long said, he had to reply with some heat. “I emptied his pockets,” Cree said of the last time the two played. Cree likes to use any team on “Madden,” so long as it has a good defense. As a linebacker, he understands various defensive schemes. Though Cree proclaims to be solid on defense, Long thinks differently. “If Andrew Cree (II) tells you that, he should be a comedian,” Long said. And then once again, Cree had to reference when he defeated Long the last time. “Well then how did he lose?” Cree said. Trash talk aside, playing “Madden” does have an educational element. The plays on the game, whether it be halfback screen on offense or Cover 2 man on defense, are actual football plays. Cree plays on defense in real life, and Long plays on offense – both can learn about the other side’s ways of thinking through playing the game. Long runs a solid pass-oriented offense that’s indicative of his acumen on that side of the ball. He knows where the holes are on defenses. Long said Cree runs a lot of Cover 4 and Cover 3, so he just throws into the defense’s holes. “He can’t really tackle, he tries to hit stick a lot,” Long said. Chukwudi Chukwu was once the best at “UFC,” but he’s willing to say he’s not anymore. For now, at least. Chukwu, a defensive lineman, is an avid player of the EA Sports “UFC” franchise, a video game based on the Ultimate Fighting Championship. 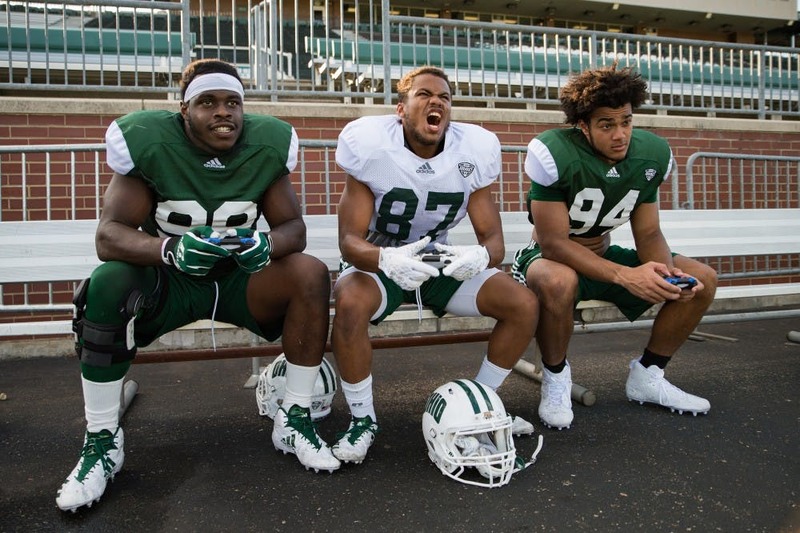 Along with Chukwu, Aloese and right guard Durrell Wood are viewed as some of the best “UFC” gamers on the Bobcats. The violence between mixed martial arts and football is different – mixed martial arts is combat. But Chukwu acknowledges a similarity in the sense that offensive linemen and defensive linemen jockey for position at the line of scrimmage. Though Chukwu has not reclaimed his title, he has recently gave Aloese some competition. When Ohio traveled to Purdue earlier this month, Chukwu brought his PlayStation 4 on the road. The two played in the team’s hotel. Chukwu won. Aloese believes Chukwu still has some work to do, though. Hagan’s favorite character in Dragon Ball Z is Gohan, but Nelson doesn’t want to hear any of that. Hagan plays “Dragon Ball Z Xenoverse 2” on Xbox One, and though he and Nelson love the franchise, they occasionally play sports games. When “NCAA Football” was still on the market, Hagan liked playing that, and he was even ranked online at one point. But not too many people on the team want to play that. As Nelson finished talking about his favorite video games, he had to add one more thing. Hagan stood off to the side, waiting to speak about his favorite games. “You out your mind,” Hagan said.